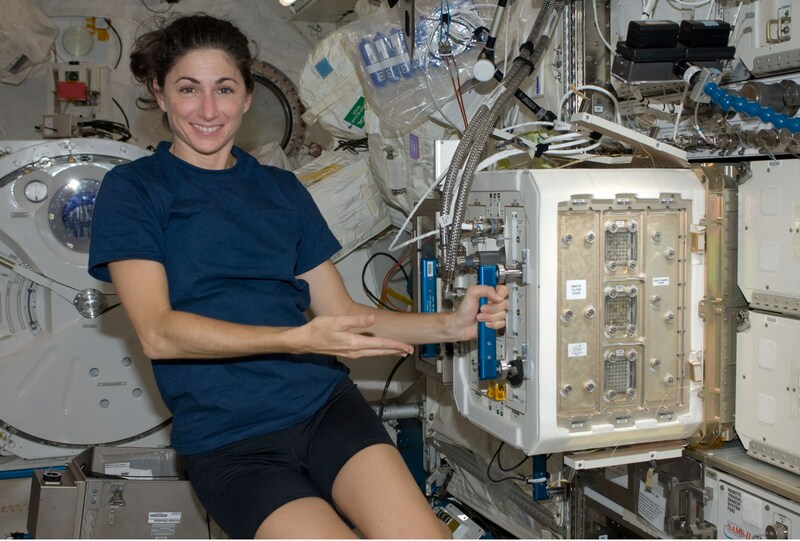 Astronaut Nicole Stott displays the Mice Drawer System on ISS during Expedition 21 (Credits: NASA). Three mice have returned to Earth alive after 91 days in space aboard the International Space Station (ISS). The mice are being studied for evidence of long duration flight impact on their physiology. One of the objectives of this experiment was to study the impact of microgravity on the reproductive organs. According to Joseph Tash from the University of Kansas in Lawrence, the reproductive organs are vulnerable to the damaging effects of radiation in space, especially if there is a solar flare event. “It releases particles that cause a huge amount of radiation damage,” he says. Microgravity and stress may also interfere with sperm production, says Tash. These degenerative effects could be due not just to radiation damage, but to the lack of gravity as well. The natural external location of the testes provides a cooler environment in the presence of gravity and convection. Without gravity the testes would sit closer to the body and without any air convection they would be at a higher temperature, which could impact sperm production in mammals. The flight duration, 91 days, for these mice sets the record for the longest spaceflight duration of any non-human living animal to date. These experimental studies demonstrate the biological consequences of reduced gravity and exposure to space radiation for a long duration spaceflight. This knowledge will help researchers prepare countermeasures for astronauts on long duration flights as well as improve the treatment for conditions found on earth. The research published in the PLOS Journal came to five primary findings including studies of space-induced changes of function of thyroid and testis, the effect of microgravity on skeletal muscles and bones, space anaemia, and the ageing process. The experiment involved 6 mice, 3 of which survived the mission duration.The remaining mice were preserved and returned to Earth for further study. Statistically speaking there are too few data points in order for the results to be statistically significant; however, early trends can be observed. Experiments in the space environment with mammals will benefit many people on the ground and are necessary for future longer term space programs.